Each year a new duck stamp design is selected by a panel of judges in the only art competition sponsored by the United States government. The winning entry becomes the Department of the Interior’s “Migratory Bird Hunting and Conservation Stamp”, the emblem of one of the nation’s most successful conservation programs. 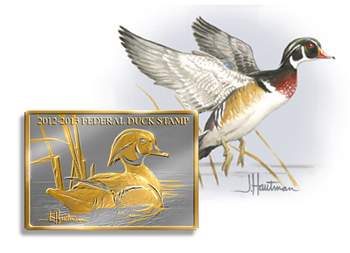 Since its inception in 1934, revenue from federal duck stamp sales has been used to add nearly six million acres to the National Wildlife Refuge System. Following a tradition of 78 years the winning design is also being made available in the form of a limited edition print, allowing you to proudly display this classic American art form along with your actual federal stamp a beautiful visual statetment of your support of this vital national program. To enhance the collectability of the prints, this program was rigorously time limited: All prints that remained unsold by the publisher as of July 15, 2013 were destroyed. Artist Proof editions (totaling 950 prints) will remain available until sold out. You may reserve numbers and place orders through your local dealer or art gallery, or from Plymouth Framery. 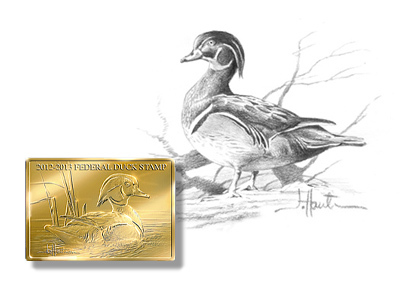 The Contest - The Federal Duck Stamp competition is the only annual art contest sponsored by the U.S. goverment. On the opening day of the publicly held contest a panel of five judges is announced. 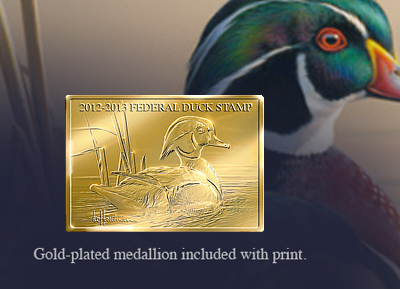 Each judge must have expertise in art, waterfowl, stamps, or conservation. The judges view several hundred entries over the course of three days, scoring each on the basis of its artistic merit, anatomical accuracy, and suitability for engraving. The paintings are presented anonymously, and the judges are not allowed to see the votes of the other judges or to discuss the artwork during the contest. Judges for this year's contest were Ira Cotton, a stamp collector (philatelist) and philatelic journalist; H. Dale Hall, a former Service Director and current CEO of Ducks Unlimited, Inc.; Gary Kramer, an award-winning freelance outdoor writer and photographer; John Neal Mullican, a sculptor whose works have been displayed in the United States and abroad; and Lynn Scarlett, former Deputy Interior Secretary and a visiting scholar and co-director at the Center for the Management of Ecological Wealth at Resources for the Future. 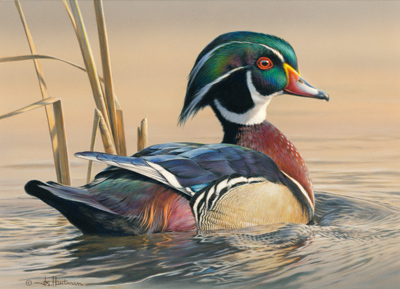 The 2012-2013 Federal Duck Print offers collectors this striking image of the colorful drake wood duck printed on high quality acid free paper with archival fade-resistant inks. Each print is numbered and signed by the artist. The edition is limited to 10,500 prints. A more limited quantity of just 2000 prints will be available with an accompanying medallion. The 24-karat gold plated medallion adds distinction and collectability to this print. This edition of the print is accompanied by a medallion and carries a detailed pencil remarque in the lower margin of the print. This very limited print, signed and numbered out of just 300, is made into a one-of-a-kind collectable by the addition of the unique original pencil drawing by Joe Hautman. The President's edition includes a distinctive 24-karat gold and silver-plated bronze medallion, and a full-color remarque by Joe Hautman. The original hand-painted remarque makes each of the 300 prints a unique and beautiful piece of artwork. Many people consider the wood duck to be the most beautiful of all North American waterfowl. It is without question one of our most striking and colorful birds. The wood duck nests in tree cavities. It is remarkably agile in flight, allowing it to maneuver through branches. Sharp claws on its feet make it well equipped for landing in trees. In the early part of the 1900’s the wood duck nearly be- came extinct. The introduction of nesting box programs and restrictions on hunting led to its recovery. Today the wood duck is once again a common visitor to wooded lakes and streams across the country and an important part of many hunters’ bags. The wood duck recovery and the Federal Duck Stamp program are two inspiring success stories in the history of wildlife conservation in America.